Zillow is a participant in Code Fellows’ job event on Jan. 16, 2013. They’re hiring! While some companies do a Hack Day, at Zillow we have Hack Week twice a year. There’s only one rule during Hack Week: you’re not allowed to work on your normal job. Hack Week starts on a Monday and runs for seven days, with final project presentations at the end. Of course, along the way we stir things up with fun activities, but mainly lots of food and drinks. Ezell’s Chicken and Thai Kitchen are some of our team’s favorites. Our fancy Starbucks machine runs overtime, and we keep everyone going with healthy snacks and fruit. One of the best parts of Hack Week is the way teams share what they are working on, solicit input and work together to build cool stuff. While we have incredibly smart and talented developers, designers, program managers, test engineers and operations engineers, they all realize that working collaboratively is the only way to ensure the best work is done. Hack Week is also an opportunity for people to step outside their typical roles. It is great to see program managers writing code and test engineers working on product designs. 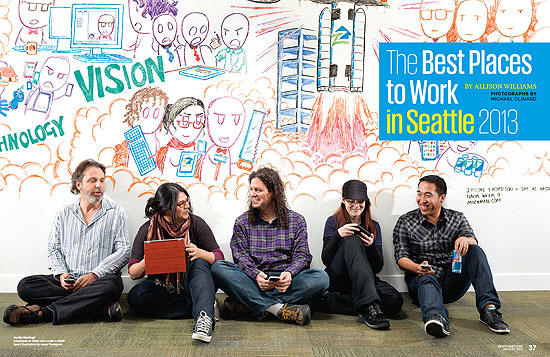 Seattle Met named us one of the top 25 places to work in Seattle. One of our employees was on the cover, and here’s the article. We have free beverages, an espresso machine, fresh fruit delivered twice weekly, free lunches delivered almost every week, candy and a game room. We’re a social bunch, so that means fun parties and get-togethers every quarter. We’re in the heart of downtown. Our office has amazing views of the Sound, Mt Rainier and the Cascades depending on what side of the building you sit on. For a tour, check out this video on GeekPeek TV. The most important thing we do at Zillow is recruit and retain talented people. Without our people, we are nothing. Hence we hire first and foremost for IQ, then for energy and passion, and then for culture fit. Subject matter expertise is a distant fourth, and can actually be a detriment for people in certain positions. It’s good to hire people who don’t have preconceived notions of what might be impossible based on their prior experience in the industry. What positions are you hiring for? We’re hiring Software Engineers, SDET’s and Build Engineers. Our main language is Java, but we also use Python and Objective C. We’re a Linux shop. Want to work at Zillow?